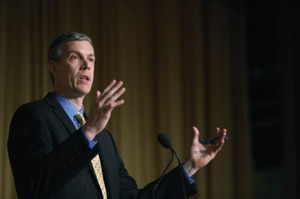 Secretary Arne Duncan addresses HBCU Leaders at the National HBCU Week Conference. The apology comes after a year of heightened tensions between HBCU college presidents and the administration following a dramatic decrease in student enrollment at many of the 106 HBCUs after thousands of parents were deemed ineligible for the popular loan program due to the new credit criteria imposed by the Department of Education. Earlier this year, relations had deteriorated to the point that several college presidents were floating around the idea of suing the administration. Despite the PLUS Loan debacle, Duncan said that the administration has never faltered in its firm commitment toward HBCUs. He said that during President Obama’s first term, the administration secured large increases in higher education funding, adding that the funding for HBCUs increased from $3 billion to $4 billion between 2007 and 2012. Another $600 million in loans was invested into capital projects during that same period. The problem, Duncan said, is that new funding has been stalled by the Republicans in Congress. In addition to funding and the PLUS-Loan programs, some administrators at HBCUs expressed concern about a new initiative Obama announced, charging the Education Department with developing a college rating system for the start of the 2015 school year. Under the plan, the college rating system would be used to transform the way federal student aid is awarded to students, starting in 2018. Lezli Baskerville, president and chief executive officer of the National Association for Equal Opportunity in Higher Education, said that she was intrigued by the new system, which will help institutions address issues of access, affordability and outcomes. Jamal Watson can be reached at jwatson1@diverseeducation.com.